After a volatile two-month tug-of-war between buyers and sellers, the S&P 500 index (SPX) now appears to be aimed for a “retest” of key “neckline” resistance located at the 1,275 level. Although overbought conditions are nowhere to be found, the likelihood of a failure at or near the 1,275 appears to be a good bet. 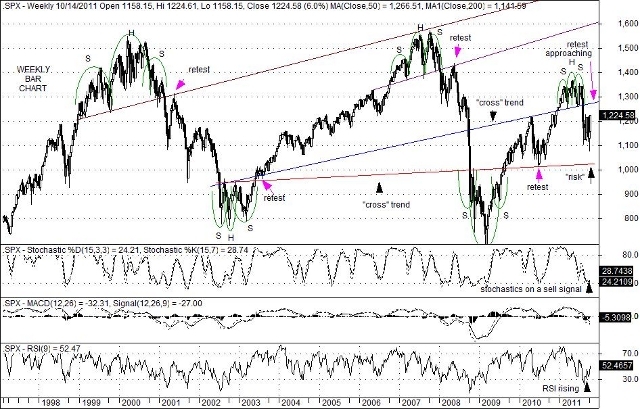 Similar technical circumstances were present in the aftermath of two bearish “Head & Shoulders” patterns in 1999-2001 and 2006-2008; and in two bullish “reverse Head & Shoulders” patterns in 2002-2003 and 2008-2009. In each case, the subsequent “retest” of neckline resistance or support (depending on the formation) resulted in a failure to break beyond. Although overbought conditions on weekly charts were present for the May 2008 neckline retest, overbought conditions were not present during the May 2001 retest. Moreover, oversold conditions were not present for the August 2003 retest, but came close to being so during the July 2010 test. These observations suggest that overbought or oversold conditions are not necessarily indicative of whether a “break” will or will not occur. What appears to be important, however, is the neckline test itself, particularly during periods of less-than-ideal levels of investment or political clarity. This uncertainty is one key reason why the Volatility (VIX) has maintained an unusually high level of readings since July of this year. While it is entirely possible that a “break” above neckline resistance could occur “this time”, the price activity of the SPX over the past dozen years or so suggests that it won’t. This entry was posted on Sunday, October 16th, 2011 at 5:07 pm	and is filed under The S&P 500 Index (SPX). You can follow any responses to this entry through the RSS 2.0 feed. You can leave a response, or trackback from your own site.